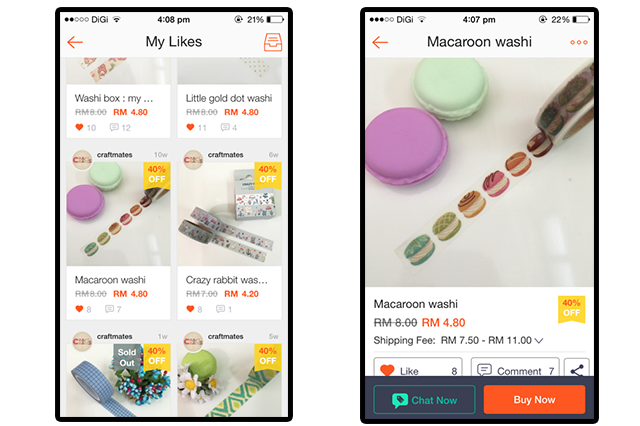 **Download Shopee app on your phone, search for seller/product type/ Shop! Here I was looking for some Washi Tape. I saw this one seller so I go to her page. What I love to do it go through all of the product she sells and click the ❤ heart (Like) button. So this will be save in my Like section. Kinda like a wishlist page. So after finish scrolling, I go through my "My Likes" page to see which one O really wanted to buy. I click on each items that I wanted and click "Buy Now". You can also directly chat with the seller if you have questions. After adding all of the items I want, I can quickly see through what is in my cart to confirm. The I proceed to check out. Of course, I have to love the payment option. I love direct online banking. I find it is safer and faster. They have 3 different payment option which are Credit Card/Debit Card, iPay88 or Manual Bank in Transfer of you don't have access to online payment options. After that I just confirm my shipping address and place my order. After a few hours, I got my payment as confirm and the next day I got a notification that my order was shipped! All of the details are in the message including my tracking number. Easy kan! Good thing about Shopee is that the seller won't be able to get your payment unless you receive your product. So worry free of scams and fraud! I find that in Shopee we have many local sellers that offers rare items (which I love) and I find that they are more cheaper than most marketplace. From Beauty, to Fashion, Stationary and many more! They also let seller to hold up Sale for buyers easily. Along the way i can also be a seller easily. I can sell any thing that I don't think I be using anymore or simply open up a shop selling things I would love! Other than stationary did I mention beauty products? Oh come on. More reason to shop eyh? Haha! There is a store called Wako Beauty. Selling your favorite Korean brand I could say? But wayyyy cheaper! 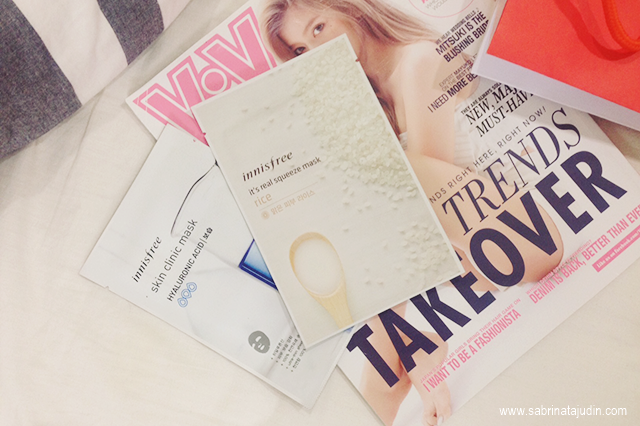 I got my self the Innisfree mask and the Hyaluronic Acid. They are way cheaper than what I usually saw in other places plus they are authentic products as well. Been wanting to try them for so long! Got a great deal here! Another store are called Arche Digital. They have this skincare called Luminesce . I got the Youth Restoring Cleanser. They also have the ageless eye cream. Remember the viral video that go all over FB? That eye cream can reduce your eye bag within minute! 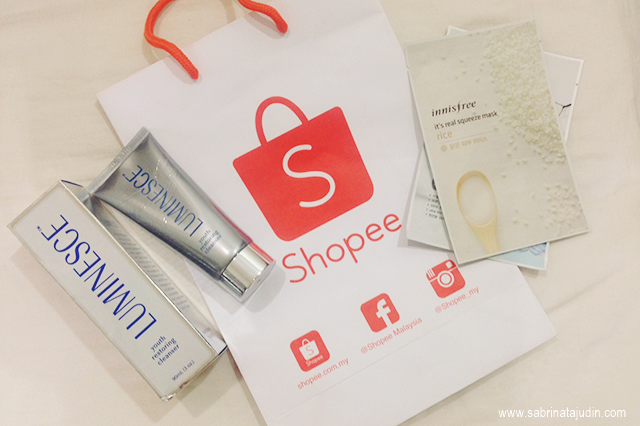 You should really check out Shopee. More products that you could ever imagine and they are have greater deal there plus the products are authentic and safe to shop. - Discount is cap at RM20 only. I'm back for another skincare review that I have tried recently and proud to say its a home grown brand that you need to check out. I never tried these type of skincare before. The one that usually comes in sets. 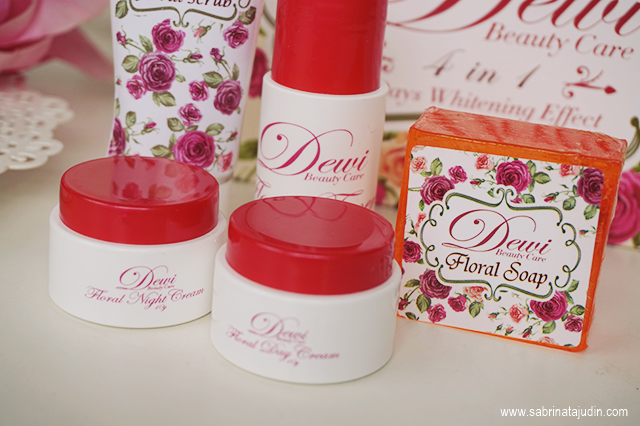 These skincare that you see above is from a brand called Dewi Beauty Care, Formulated for any skin type and targeted to common skin problem we had in Malaysia. Pointing out to the weather we have here in Malaysia which are mostly humid. Claims to give you result in just 3 days. 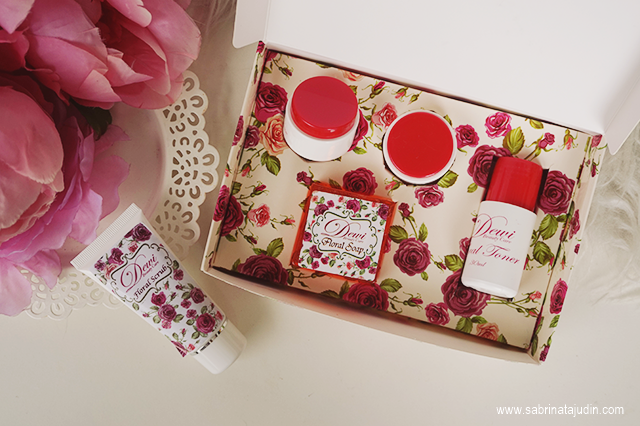 In each set it comes with a Toner, Facial Soap, Day Cream and Night Cream. They also will give you a Facial Face Scrub for free in this set. 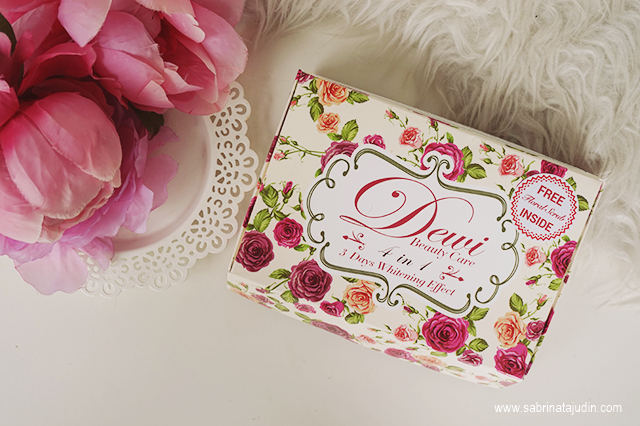 The Floral Soap (50gm) helps to removes dirt on your face at the same time leaving your skin moisturize. It said that this soap is formulated using Korea technology which promotes and have great ingredients such as Collagen, Stem Cell and Vitamin C. I store this soap on a small container in my bathroom. It foams up pretty well and what I like about this soap is the scent and how it leaves my skin fresh after washing. 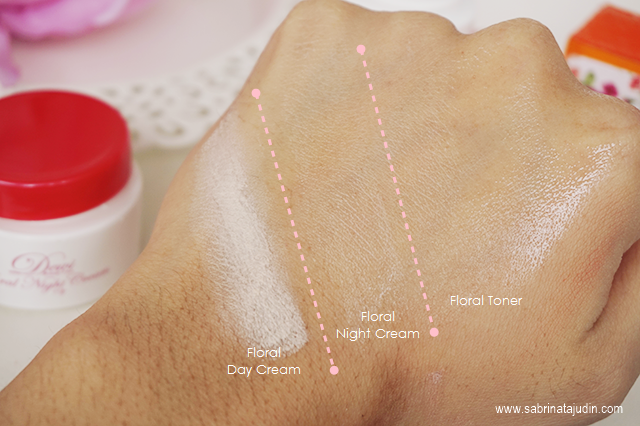 The third step during the day is by using the Day Cream. 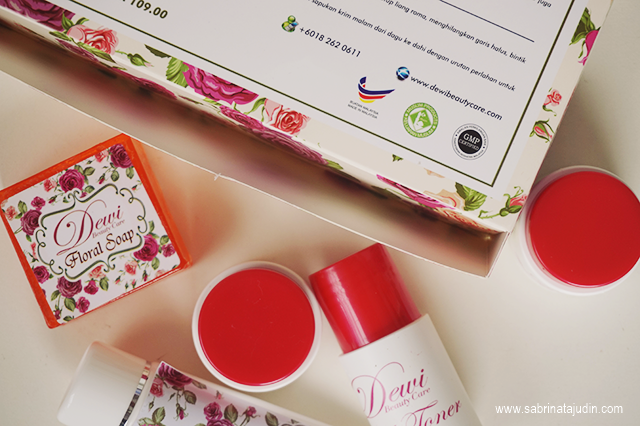 The Floral Day Cream (10gm) is a very unique cream. It has a mousse texture and it has a tint of color in it. This will help to give you a fairer look without needing and additional makeup like foundation if you don't like wearing it. I love moisturizer that leaves completely matte on your face. 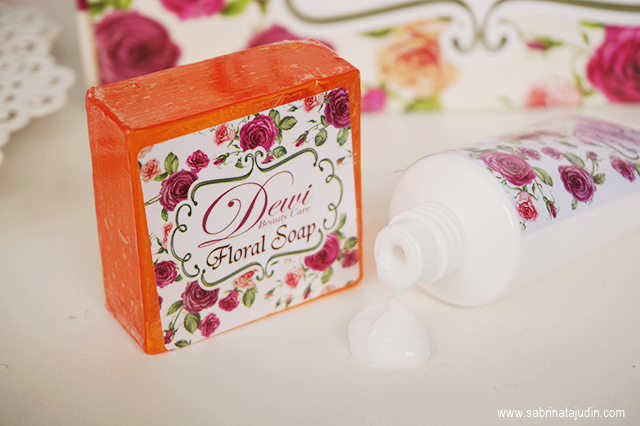 Like this Floral Day Cream! It feels light on my skin and along with that this day cream contains SPF 40 sun protection! The third step during our night routine, you can switch the floral scrub during washing your face earlier and ending it up with the Floral Night Cream (10gm) . 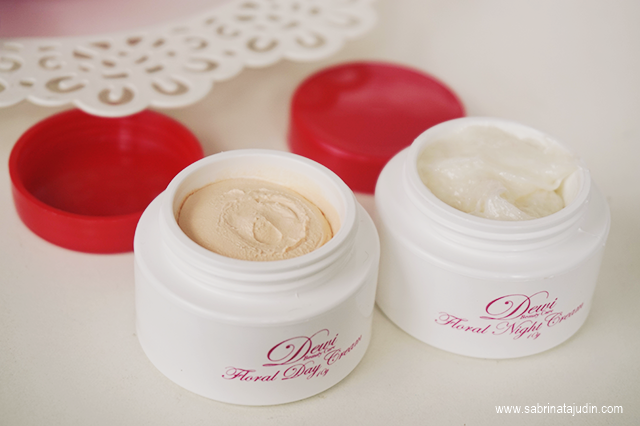 This Night cream act as a skin repairer. It helps to repair oily skin, large pores, blackheads and keeping your skin glow. The texture is a bit sticky bit after a few minutes it sets in your skin. It feels like a sleeping mask. I recommend this skin care to you who are looking for a simple skincare as a start. They are pretty small and they can last you for one month. A good trial size for you who interested in trying it! 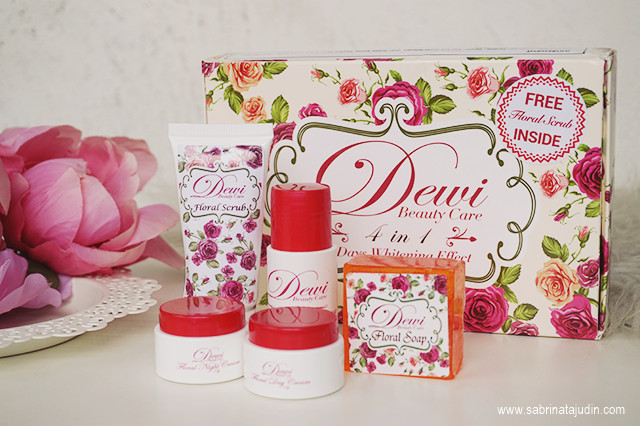 This skincare set retails for RM99.00. I still remember the time where I don't even think about my foot that much. It was like 20 years ago haha. As I grew up I realize my feetstart to get rough, especially on the heel and on the bottom front part. Well, we all age! My mom used to use this type of "stone" to remove the dead hard skin cell which I find it time consuming and very hard to maintain. Ain't got time for that (meme)! 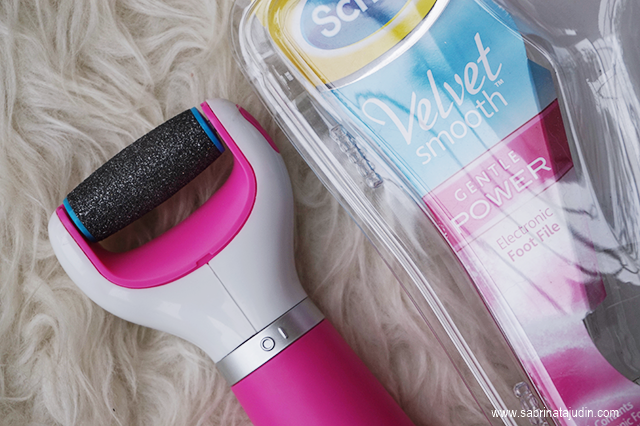 So thanks to the technology we have today, I got the chance to try the Scholl Velvet Smooth Express Pedi and it is in the Pink limited edition! Ergonomically designed that is easy to use and efficient. No more sore arms I could say. The leading foot care expert Scholl has introduced it latest innovation to help keep your feet smooth and soft easily! Now let's see how this product looks like. The handle is ergonomically designed. Firm on the hand and easy to hold on to while using it. Can't tell enough how I love this look in Pink hehe. Yep! 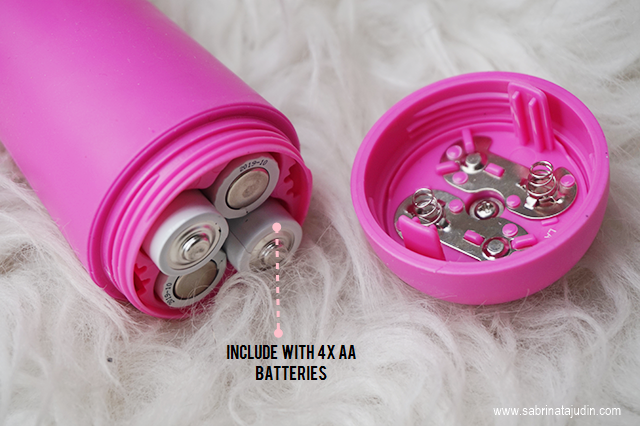 Each device that you buy include with 4 AA Batteries! This type of batteries are easy to find for future replacement! 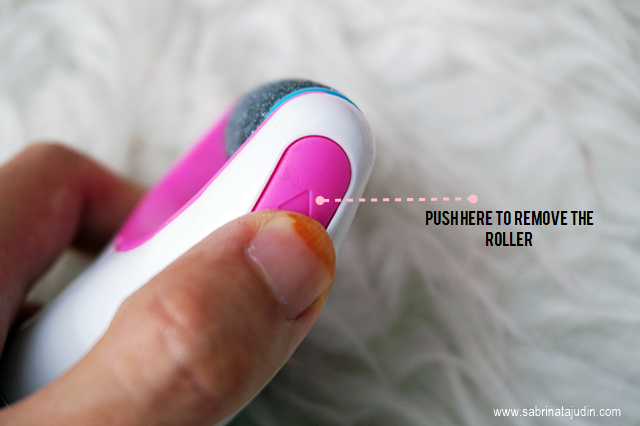 To remove the roller head, simply push the right side button, this makes cleaning easy. The roller head can be replaced with a new one easily and they are washable too! Everything is so easy lah! 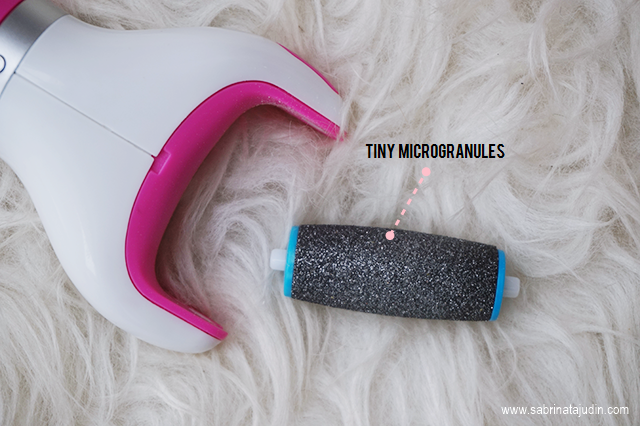 The roller head are made from Tiny Microgranules that is gentle on your skin but still able to remove hard dead skin on your feet. 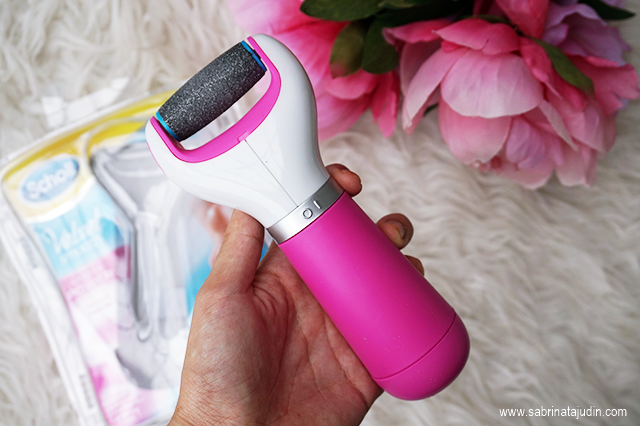 As it rotates, it helps to gently remove all that stubborn hard skin effortlessly. I'm surprise how it is not painful at all! It feels good tho, looking at all that dirty skin off your skin. It's kinda satisfying haha. 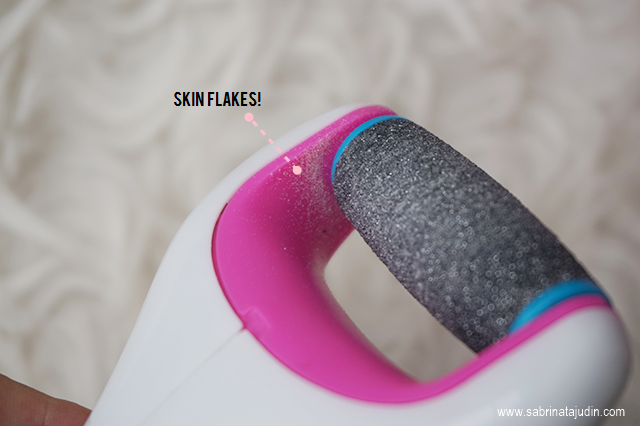 You can see some fine "skin flakes" drop as you use this device. 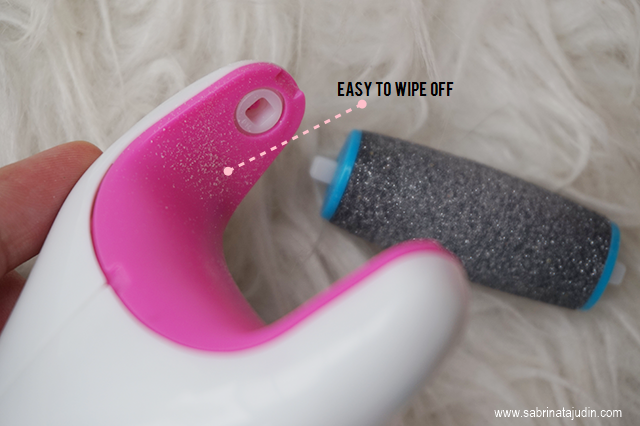 As the roller head is easy to remove, this makes cleaning so easy. Just wipe it with a tissue or damp cloth. No let's watch the live demo! Does this thing really work? This is my before & after picture! I test it first on my feet. I have an average roughness and dryness to my skin. In just a few rolls, I can feel that it remove all of my "hard skin" away easily. It is not painful at all, just maybe some ticklish feeling along the way hehe. What can I say, it is so easy to use and it works on me! I want to try on a more major skin roughness. I haven't seen anyone do this. So let's test it on my mom's feet. She has a major roughness on her feet. She is one of the people who do take care of her feet but sometimes the stone that she use is too time consuming. She was so excited about this tool. So I tried this on her. It takes a longer time to go all over her feet as she has more roughness, but she mentioned that she barely feel anything when using this express pedi. So a good point there, it is not painful at all. Then I wipe off using a wet wipe. In just one use I can see the difference as what picture shown above. Impressive! Although it is not 100% smooth but I believe in frequent care and use of this tool, you can get your feet smoother. I really recommend this to any of you who are looking for a tool to invest in for your foot care! How about some refreshing post today? That includes yummy fruit juice that is good for your body. How does that sound? yummy that is equals to healthy! Oh yeah! So I tried this 7 days detox program from Fresh Code to you know get my body back to feeling more better. As you know, we all had junk food, those nasty food in our body. With lack of exercise and such can really make our body feel weak and tired. I know you guys have been hearing about this cold pressed juice trend lately right. Well this is similar but this has better benefits than that. Why? Because it is frozen and it last longer than normal cold pressed juice. As you can see they packed in bags and yes they are ice cold! Since I live in Johor, I get to experience their Family Pack Program. If I am not mistaken they also have a local store where you can experience your self their juice in many kind of style! 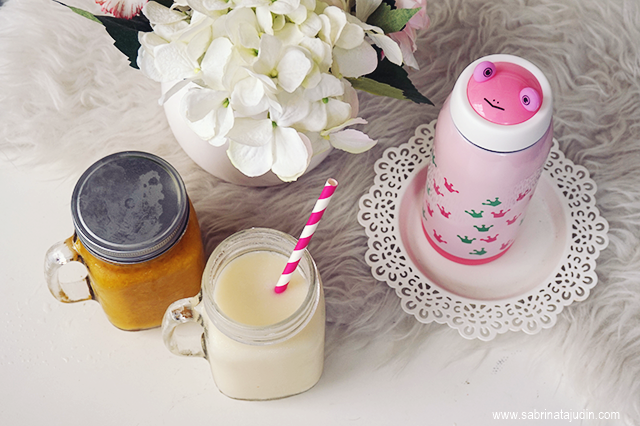 Sorbet, Yogurt Smoothie, blended juice and many more. They will send out the whole box right to your door step. And this is mine! A whole lot of yummy goodness! So they also recommend you on which one to consume first. So I lay them out according to the timetable and start defrosting the one that I will need to consume first. 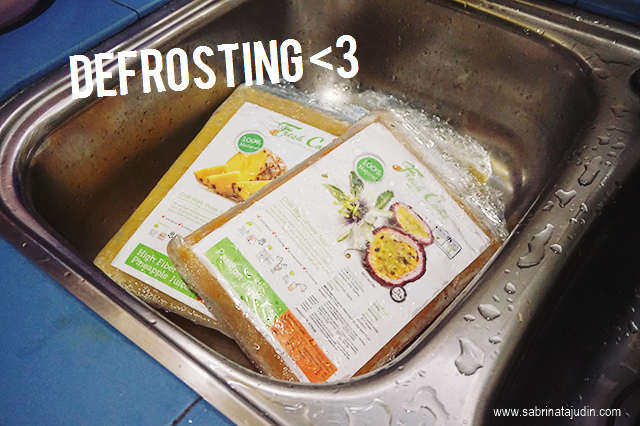 All I do it put them in the sink (no worries, they are sealed in 2 layers of plastic for protection and hygienic purposes) and let them defrost. What makes Fresh Code are different and special from others? They use fully selected ripened fruits only. They immediately cold squeezed when they are harvested and they are pasteurized using HPP technology. Even tho they are packed, I guarantee you, when you defrost it and taste it. It taste just like freshly squeeze juice. Using the latest pasteurizing technology using high pressure that reach 6000 bar (as high as 3 elephants standing on a 20cent coin!) This way it able to get rid of any harmful bacteria and make their juice safe and clean at the same time preserve all the goodness in it. They are definitely no preservatives, artificial co louring or flavor. After a few hours, they have melt I store them inside my bottle. 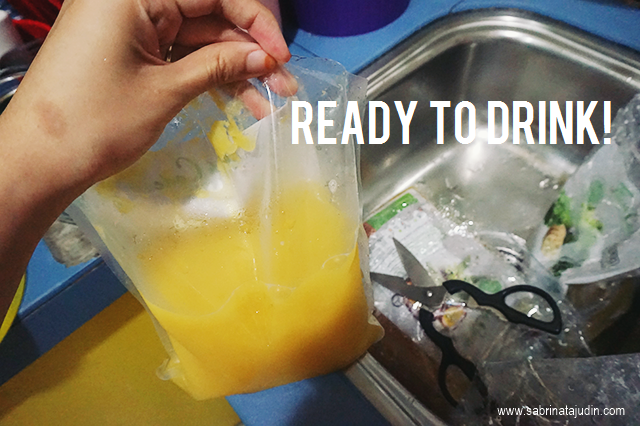 The storage tip would be "After the pack is cut, keep the juice in a closed bottle. 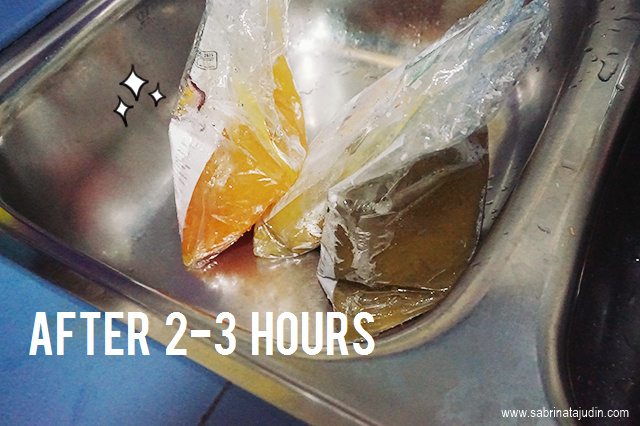 Store the juice in a chiller or refrigerator. the juice must be consumed within two days after the pack is opened.". Oh they sure looks yummy and I can barely wait when they have melt. I was about to drink them right away and forgot to take some pictures haha. Here are some of the juice that I have melted and prepare. 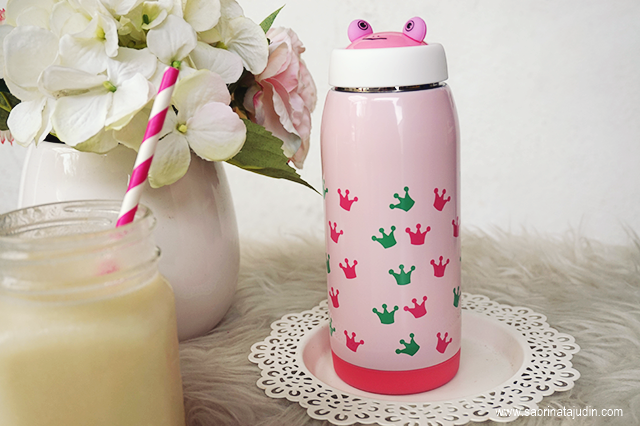 Other than drink it straight away, you can also customize this drink to your preference. 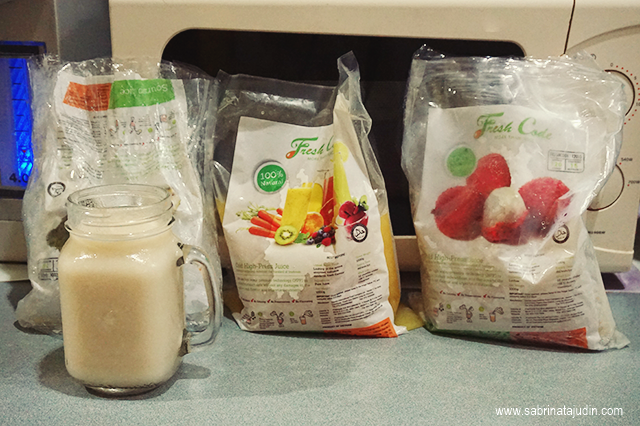 You can make it as a smoothies, or other creative invention of your own to make it more fancier! I like to drink it stright away, it takes better like that! 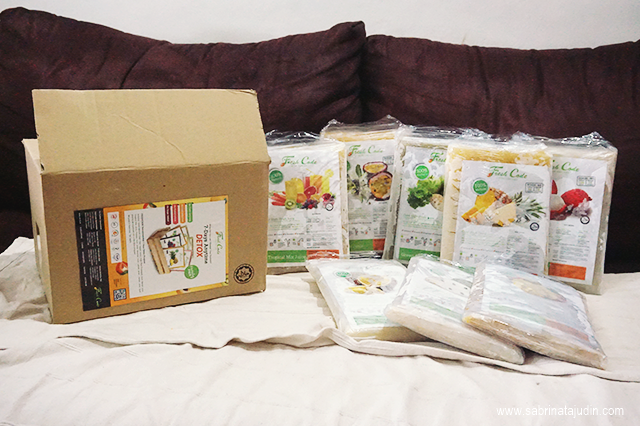 So what is the Freshcode 7-Days Detox Program all about? Featuring the Family Pack from FreshCode hat I show you, these juices are tailor made to help your body detox for that healtier lifestyle. Follow the formula to feel the difference! 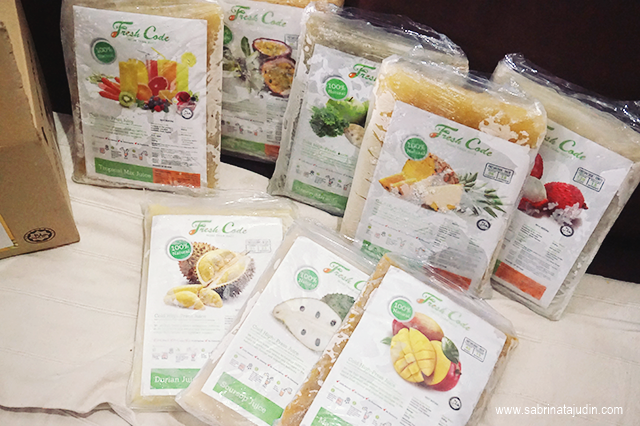 Juice include from Green Miracle (High Fiber Veggie Juice), High Fiber Pineapple Juice, Mango Juice, Tropical Mix Juice, Passion Fruit Juice, Soursop Juice, Lyhcee Juice / Durian Juice and many more. It is best to stick to this program twice a month. Since I just got pregnant I did really follow the time table properly. 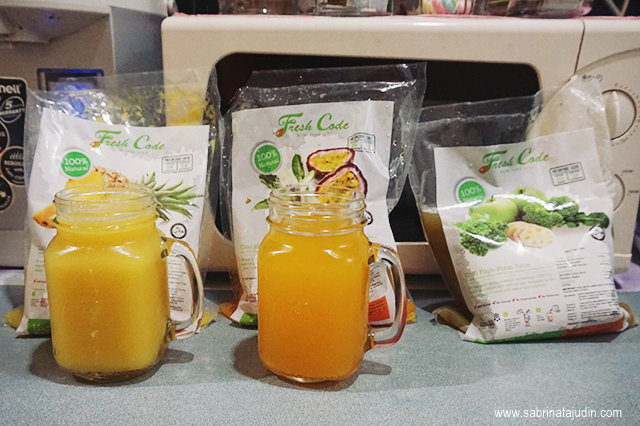 The pack that I got are High Fiber Green Juice, Pineapple Juice, Mango Juice, Tropical Mix Juice, Passion Fruit Juice, Soursop Juice, Lyhcee Juice & Durian Juice. I did not consume the durian because I am afraid of body heating. The best way to consume this are during the morning (300ml-400ml) with light breakfast, Before lunch (300ml-400ml) without ice and continue with light meal and during the evening, jog for at least 25 mins at medium speed. Drink (300ml-400ml) of the juice of the day and continue by light meal. What it means by light meal is that meal that has less oil and fried food. Something clean and maybe some whole foods. The whole pack can last for the whole day as what the time table shown. My favorite juice has to be sour-sop, Tropical mix, passion fruit and mango. Hits the craving I got along this time. I find that these juice helps with my digestives system. Especially around this time where I have trouble going to the toilet. I wish I could redo this again when I am not pregnant. I think this 7 days detox program is really a brilliant idea. Their juices are fresh and amazingly delicious! Look at your calendar now? What date is today? Its 11.11! How cool is that! haha! and what another cool thing I wanna share today? It is Shopee Mega 11.11 Sale! Ok calm down, let me give you a brief on what going on. Starting now 11am till 11pm today there will be massive promotions and discounts to all of your favorite items! You name it! Shoes, both men & women clothing, beauty product (squeals!) and many more. Crazy Discount for today! So what time is it again? 11am? So what is the promotion going on right now? Enjoy RM20 off for that show that you have been eyeing on! Oh yeah. Simply use the code as displayed. These promotions are valid for only one hour at a time. After the times goes out, there will be another new promotions. What's next? Here is a sneak peek : Oh yeah! clothing! Want to know more? You are lucky to be here because I got all of the insider news! Check all of the discount below! A lot of things I'm aiming right now. They have discount for kids stuff too. I wish I know my baby gender so I can buy some toys in advance haha. 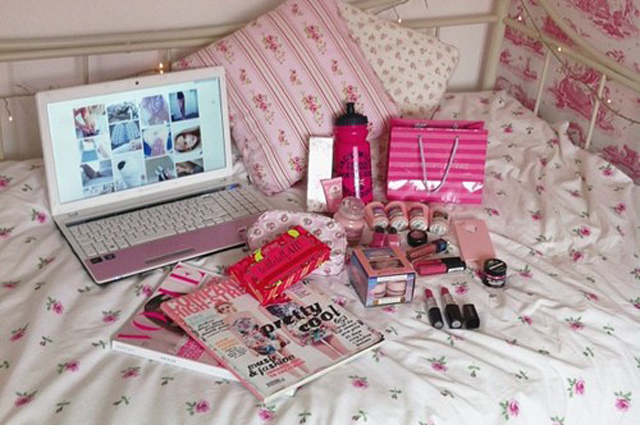 Looking forward for the beauty products and home furniture too! Use these code listed above to enjoy the promotions ok! Everyone has these situations. There were times were something we just don't use anymore right. Something we call pre-loved I must say? Rather than posting it out of no where with only your friends to see, Shopee is a mobile marketplace where you can buy and sell things to everyone easily! You can enjoy fast, smooth and safe transaction without having to worry about anything. You never know that you can turn your old un-worn stuff to some cold hard cash haha! Anytime and anywhere. Here is a glance on how the apps looks like. You can insert your product image easily, and also put in some details to explain about it. If you are a buyer, you can check them easily too. 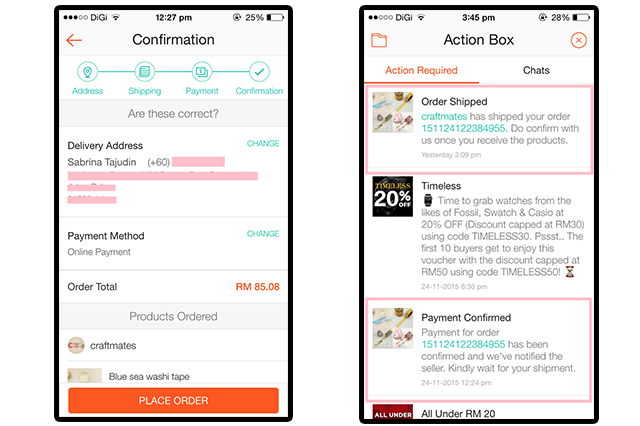 You can also communicate with the seller without having to wait for your "PM" to be reply. haha. 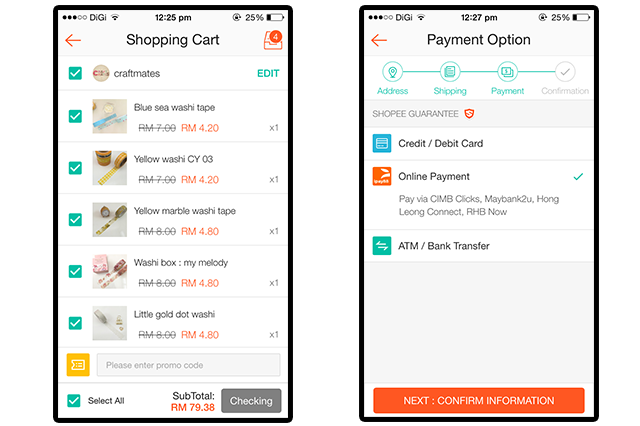 Shopee Guarantee that payment is sent to the sellers only after buyers receive their purchases. So worry free! This app are completely FREE with no hidden charges. So what are you waiting for? Shop naaawwww!